Larger grain borer (LGB) | Infonet Biovision Home. Larger grain borer (Prostephanus truncatus). 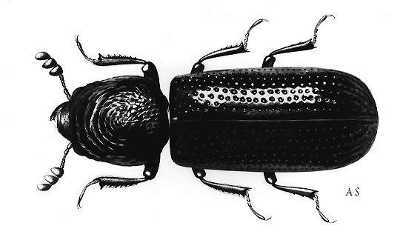 The adult beetle is 3-4.5 mm long. Predator of LGB (Teretrius nigrescens). Initial releases of T. nigrescens were in Togo in 1991 and Kenya in 1992 where it became well established and spread. Subsequently, also predator releases in Benin, Ghana, Tanzania and Malawi. However, despite the successful introductions, there are still regular outbreaks of P. truncatus and farmers still suffer losses. Adult beetles of Maize weevil (Sitophilus zeamais) in maize. Adult emergence holes with irregular edges are apparent some weeks after the initial attack. The maize weevil (Sitophilus zeamais) adult. 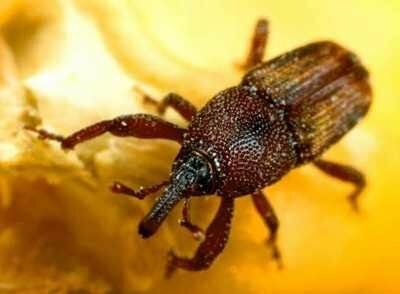 It is possible to confuse the maize weevil with other storage insect pests such as the larger grain borer - LGB (Prostephanus truncatus). The end of the body of the maize weevil is more rounded than that of the LGB. 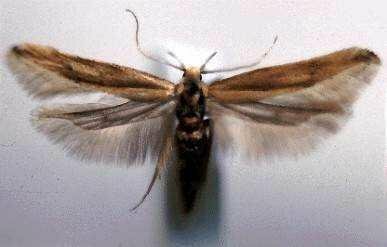 The larger grain borer has been reported in Benin, Burkina Faso, Burundi, Ghana, Guinea, Kenya, Malawi, Mozambique, Namibia, Niger, Nigeria, Rwanda, South Africa, Tanzania, Togo, Uganda and Zambia. The larger grain borer was accidentally introduced from Central America into Tanzania in the late 1970s, and spread to other countries in the region. In West Africa it was first found in Togo in the early 1908s. It has now spread to many African countries becoming the most destructive pest of stored maize in both West and East Africa. 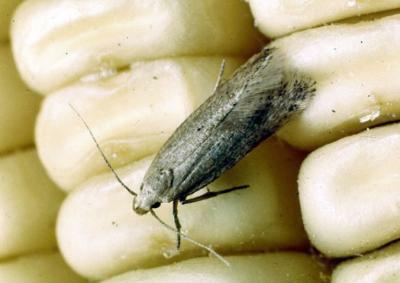 The larger grain borer is a serious pest of stored maize and dried cassava roots, and will attack maize on the cob, both before and after harvest. Adults bore into the cassava or maize husks, cobs or grain, making neat round holes and tunnelling extensively producing large quantities of grain dust as they tunnel. The adults prefer grain on cobs to shelled grain, thus damage on unshelled maize is greater than on loose, shelled maize. Maize cob damaged by the larger grain borer. When infesting stored maize cobs with husk intact, the adults frequently begin their attack by boring into the maize cob cores, and eventually gain access to the grain at the apex of the cob by crawling between the cob and husk. They may also bore directly through the husk. They cause considerable losses in stored maize; weight losses as high as 35% have been observed after only 3 to 6 months storage in East Africa. Losses in dry cassava can be very high too; the dried roots may be readily reduced to dust by boring adults. Average losses of 19% have been recorded after 6 months storage and as much as 30% in some cases. The larger grain borer is spread over longer distances almost entirely through the import and export of infested grain. Local dispersal is through the local movement of infested maize and dried cassava and by flight activity of the adult beetles. 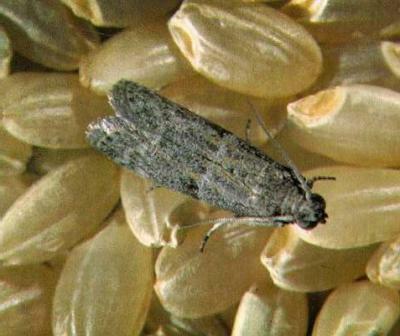 Although the larger grain borer develops best at high temperature and relatively high humidity, it tolerates dry conditions, and may develop in grain at low moisture in contrast to many other storage pests, which are unable to increase in number under low moisture conditions. For this reason, infestations of the larger grain borer usually found together with other storage pests, is the predominant under dry conditions. Attack by the larger grain borer is sporadic. Pest incidence may be low for several years and then suddenly increase in a "bad" year. Adults tunnel through stored maize grain or other starchy products, such as dried cassava chips, creating large quantities of dust. The larger grain borer is reported to breed only in maize and cassava. The adults can, however, live in and damage many stored products such as bulrush millet sorghum, yam, and wheat, as well as structural wood and wooden utensils. Adults also bore into a wide range of foodstuffs and other materials such as bamboo, gourds, plastic and soap. In heavy infestations, wooden storage structures may be become damaged and act as reservoirs of infestation from which the new harvest may be attacked. The larger grain borer also occurs in the natural environment. It is able to breed on dead, dry wood of a range of trees, as well as dried stems of cassava and maize plants. Studies of this pest using pheromone traps showed that it was widespread in the natural vegetation in the Tsavo National Park, Kenya (Nang'ayo et al., 1993, 2002, Nansen et al., 2004). Seeds: holes, large quantities of dust. The larvae are white, fleshy and sparsely covered with hairs and have three pairs of legs. They develop within the grain or in the flour that accumulates by the feeding action of the adults. They pupate inside the food source. The adult beetle is 3 to 4.5 mm long and dark brown in colour. It has a cylindrical body shape, when viewed from above the rear of the insect is square shaped. The thorax bears rows of teeth on its upper front edge and the head is turned down underneath the thorax so that it cannot be seen from above. The female lays 30 to 50 eggs into the produce (maize, cassava, etc). The lifecycle can be completed within 25 to 26 days at optimum conditions - this is high temperature (about 30degC) and relatively high humidity (about 70% RH, + 13% grain moisture content). Development takes longer under cooler or drier conditions. The larger grain borer develops more rapidly on maize grain than on cassava. 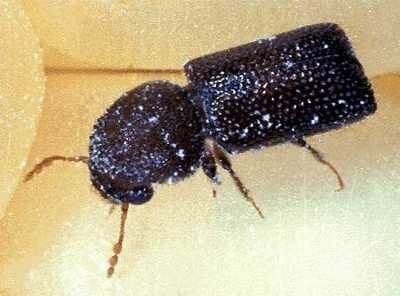 Further below you find concrete preventive and curative methods against Larger grain borer. Except when populations are very high is not possible to detect the pest by visual inspection. The immature stages develop within the food source, and therefore they are not normally seen. Traps baited with the chemical attractant (pheromone) produced by the male beetle are useful to detect and monitor adult beetles. This pheromone is synthesised in the laboratory and loaded into plastic capsules, which then release the pheromone slowly through their walls. A pheromone capsule is then placed in a suitable trap. Flight traps, such as funnel, delta or wing traps baited with the pheromone are considered the best for monitoring the larger grain borer. These traps are suspended about 1 to 2 m from the ground outside the store or the standing maize crop. They should be placed at least 100 m from stores or from the field to avoid attracting the beetles to these food sources. The traps are useful for researchers and for plant protection authorities. Traps are an important tool for phytosanitary purposes and for warning farmers about impeding attack by the larger grain borer. However, small populations already feeding on maize or cassava in a store cannot be detected by pheromone traps because the pest does not react to the pheromone until dispersing from its food source. Only when the population has increased to an extent whereby the infestation is obvious and the beetles are starting to disperse will the traps catch beetles. Presently, the only means of assessing infestations in store is by manual sampling of the produce. A detailed leaflet giving recommendations on the use of pheromone traps to monitor the larger grain borer has been prepared by Hodges and Pike (1995). Although the traps and pheromones are available commercially, they are expensive and not easy to get. See under reference addresses. Good store hygiene is very important in limiting infestation. Clean store thoroughly between harvests. Remove and burn infested residues before the new stock is stored.Immerse used sacks in boiling water to eliminate residual infestations. Eliminate residual infestation in the wooden structure of the store by removing timber or by fumigating the whole store under a gas-tight sheet. When maize is ready for harvest, do not leave it for too long in the field; the larger grain borer or other storage pests could attack it. Studies in Benin have shown that maize harvested 3 weeks after physiological maturity gave better economic returns when stored for 8 months than maize harvested 1 or 7 weeks after physiological maturity. Leaving the maize in the field for extended periods after physiological maturity resulted in severe grain losses after 8 months of storage, mainly due to damage by the larger grain borer. However early harvested maize had a higher proportion of mouldy grain (Borgemeister et al., 1998). In locations where the larger grain borer is a problem, shell infested cobs as soon as possible before storing and dry completely to below 12% moisture (safe for bagging); when the kernels are too hard to bite through with the teeth they are usually dry enough for bagging. Treat the grain with a botanical pesticide. Traditional varieties with good husk cover are much less likely to be attacked, thus when storing these varieties on the cob, reject any cobs with damaged or open sheathing leaves. (Meikle et al, 2002; Borgemeister, et al, 2003). In the case of cassava, leave roots in the ground for as long as possible to reduce the storage period in order to minimise losses. After harvest, sun dry the cassava and immediately transfer it to sealed containers. Store only clean produce. Carefully inspect the store before the newly harvested maize or cassava is placed inside and sort out infested cobs or roots for immediate use. Store the grain in a suitable container. The larger grain borer easily attacks grains stored in gunny bags or guards. Moreover, this pest also damages guards. The most suitable containers are those that can be sealed such as metallic containers, old oil drums or mudded cribs or baskets. They provided a very effective barrier to pest attack and can be used provided the stock is sufficiently dried so that ventilation is not required. Use brick stones to construct the granaries; wood and grass would encourage breeding and multiplication of the larger grain borer. Prefer iron sheet roof for the stores to avoid harbouring the pest. If using grass thatched, it should be a thick layer and cone shaped; the roofing should be replaced after a certain interval period to minimise leaking. Sell the maize within 3 months since the extent of larger grain borer infestation during the first 3 months of storage is generally low. Alternatively split the maize harvest into two portions. One portion, destined for consumption by the familiessince the extent of large brain borer infestation during the first 3 months of storage is generally low. Alternatively split the maize harvest into two portions. One portion, destined for consumption by the families, should not be kept longer than three months in the store. The other portion to be kept longer in the store should be treated if larger grain borer was observed the previous year. If not, the stock should be regularly inspected. If the pest is found subsequently then grain shelling and treatment either with a botanical or with an inert dust is required. 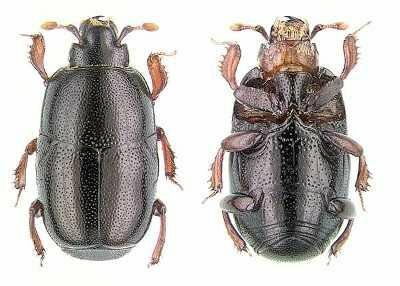 The beetle Teretrius (formerly Teretriosoma) nigrescens, which is a specific predator of the larger grain borer in Central America, has been introduced into Africa. The adult and the immature stages of this predatory beetle feed on eggs and larvae of the larger grain borer. The predatory beetle has been released in Benin, Ghana, Guinea-Conakry, Kenya, Malawi, Tanzania, Togo and Zambia. It became well established and spread in most countries. However, despite the successful introductions, there are still regular outbreaks of the larger grain borer and farmers still suffer losses. 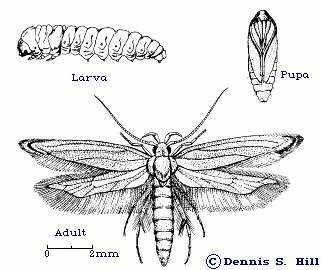 Nevertheless this predator has a role to play in the management of the larger grain borer, as it is able to reduce the density of the pest. Using plant material in the form of slurry has given better results than plant powders. The slurry can be prepared by weighing out powder into 150 ml containers and adding sufficient water to give a 10% concentration (w/w), and stirring until a smooth paste is obtained. Then, the grain is poured into prepared slurries and stirred with a rod until all grains are coated (Tierto, as cited by GTZ, and Stoll, 2003). Neem shows considerable potential for controlling pests of stored products. Jute sacks are also treated with neem oil or neem extracts to prevent pests - particularly, weevils and flour beetles- from penetrating for several months. However, neem products are not as effective for protection of maize grain against the larger grain borer as against grain weevils. Pyrethrum is much more effective. Since these two pests are usually found together, a mixture of neem and pyrethrum known as ("Nimpyr") seems as a better option to protect stored maize. Trials in Tanzania showed much lower grain damage in maize treated with "Nimpyr" (0.5 - 6% kernel infested) compared to untreated maize (17% to over 90%) 6 months after treatment. A relatively large amount of the mixture is needed to protect grain (2 to 3 kg/ 100 kg grain). The labour input needed to manufacture "Nimpyr" is considerable. The active principles of pyrethrum deteriorate relatively rapid on exposure to heat and/or light. Pyrethrum has an unpleasant odour, whilst neem has a bitter taste (although this can be eliminated by soaking and washing the grains in water for a sufficient period). 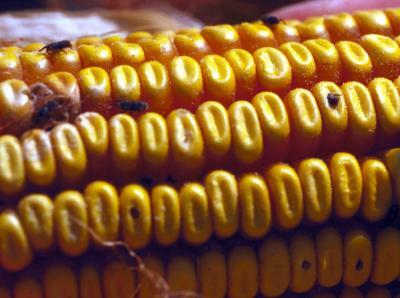 The mixture is unlikely to give protection in maize stored in cobs, since the pests are protected under the husks. How to prepare and use "Nimpyr"
Collect ripe neem fruits; tease out the seed kernel, wash and dry in the shade for 3 to 5 days. Then pound the kernels into a fine pulp, dry for a further 1 to 2 days, crush with the fingers and sieve. Pound and sieve again until a fine powder is obtained. Do not use the same mortar as for food processing because of the bitter taste of the neem seeds. Pluck the dry florets of pyrethrum, pound in a mortar and sieve. Florets and powder quickly lose their effect in the sunlight. Therefore, store florets away from the light if they cannot be processed immediately. Use powder straight away. To treat 100 kg of grain, mix 1.5 to 2 kg of neem seed powder with 0.5 to 1 kg of pyrethrum floret powder. When the grain is well dried, distribute this preparation over it and mix in carefully. Store without delay. Grain intended for consumption must be soaked and washed in abundant water before use to eliminate any unpleasant odour or taste. (Source: GTZ- Plant derived products as protectants against the larger grain borer and other stored-food pests). Neem oil is an extremely effective and cheap protection for stored beans, cowpeas, and other legumes. It keeps them free of bruchidbeetle infestations for at least 6 months, regardless of whether the beans were infested before treatment or not. This process may be unsuitable for use in large-scale food stores, but it is potentially valuable for household use and for protecting seeds being held for planting. The treatment in no way inhibits the capacity of the seeds to germinate. Neem has also been used in India to protect stored roots as well as tubers against the potato moth. Small amounts of neem powder are said to extend the storage life of potatoes for 3 months. (OIA 1992). Ash/chilli mixture and a thick layer of paddy husk ash covering the stock is reported to be effective in preventing larger grain borer attack. The use of diatomite earth for control of grain boring insects during storage has in many cases been successful. Mix diatomite powder with grain before storing in bags or dust newly harvested dry cobs before storing them with diatomite. Use 1 kg diatomite per bag of maize or grain. Some confusion exists on the use of diatomite earth, as finer ground diatomite products commonly used for sifting beverages is not effective as insect control. However unprocessed products such as 'Kensil Lagging' work on the same principles as laterite mentioned below, by dehydrating the insects and by destroying the insects' articulations. The common red soil of the arid tropics, when finely crushed protects stored grains and beans. In family grain stores or in sealed clay pots, the dust deters insects from boring into or laying their eggs on the dusted grains. Laterite rubs off the waterproof waxy coating the insect bodies and they dehydrate and die. In sealed storage pots insects suffocate because enough dust is poured in with grain to exclude air and also trapped insects dehydrate and die as their outer coating is damaged by abrasion. Borgemeister, C., Adda C., Setamou, M., Hell, K. , Djomamou, B. , Markham, R. H., and Cardwell, K. F. (1998). Timing of harvest in maize: effects on post harvest losses due to insects and fungi in central Benin, with particular reference to Prostephanus truncatus (Horn) (Coleoptera: Bostrichidae). Agriculture, Ecosystems and Environment. Volume 69 (3). Borgemeister, C., Holst, N. and Hodges, R. J. (2003). Biological Control and Other Pest Management Options for Larger Grain Borer (Prostephanus truncatus). In Biological Control in IPM Systems in Africa. Eds. P. Neuenschwander, C. Borgemeister and J. Langewald). ISBN: 0-85199-639-6. Compton JAF, Sherington J, (1999). Rapid assessment methods for stored maize cobs: weight losses due to insect pests. Journal of Stored Products Research, 35(1):77-87. GASGA (1993). Larger grain borer. Technical Leaflet No. 1. Group for Assistance on Systems Relating to Grain After Harvest (GASGA). Published by the Technical Centre for Agricultural and Rural Cooperation (CTA). June 1993. GTZ - FAO. (1990). 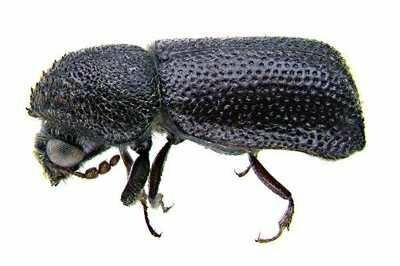 Implementation of and further research on biological control of the larger grain borer. Proceedings of an FAO/GTZ Coordination Meeting. Lome, republic of Togo, 5-6 November 1990. J. Boeye, J., Wright, M. and G. A. Laborius (editors). ISBN: 2.906718-33-5. GTZ. Integrated Store Product Protection for Farm holders. A Synoptic Compilation of Measures to Control the Larger Grain Borer (LGB) and Associated Storage Pests in Maize and Dried Cassava. Tanzanian-German Project for integrated Pest Management (IPM). GTZ. Plant-derived Products as Protectans against the Larger Grain Borer (Prostephanus truncatus) and other Stored-food Pests. Integrated Control of the Larger Grain Borer and Associated Insect Pests in Farmers' Stores. Hodges, R.J. and Pike, V.(1995). How to use pheromone traps to monitor the Larger Grain Borer (Prostephanus truncatus). Chatham Maritime, Kent, UK: Natural Resources Institute. Hodges, R.J., Dunstan, W.R., Magazini, I., Golob, P. (1983). An outbreak of Prostephanus truncatus (Horn) (Coleoptera: Bostrichidae) in East Africa. Protection Ecology, 5(2):183-194; . Holst, N., Meickle, W.G., Nansen, C., Markham, R.H. (2000). Analysing the impact of Teretrius nigrescens on Prostephanus truncatus in maize stores in West Africa. Proceedings of the International Congress of Entomology, Foz d'Iguazu, Brazil, August 2000, vol II:1015 (Abstract only). Holst, N., Meikle, W.G., Markham, R.H. (2000). Grain injury models for Prostephanus truncatus (Coleoptera: Bostrichidae) and Sitophilus zeamais (Coleoptera: Curculionidae) in rural maize stores in West Africa. Journal of Economic Entomology, 93(4):1338-1346. Holst, N.; Markham, R. H. and Meikle, W. G. Integrated Pest Management of Postharvest Maize in Developing Countries. IITA. (1990). Biological control of the larger grain borer. R. H. Markham and H. R. Herren (editors). Proceedings of an IITA/FAO coordination meeting. Cotonou, Republic of Benin, 2-3 June 1989. IITA/ FAO.ISBN: 978-131-055-3. Meikle, W. G. Holst, N. Degbey, P. and Oussou, R. (2002). Pest Management in Traditional Maize Stores in West Africa: A Farmer's Perspective. Journal of Economic Entomology. 95, 1088-1097. Nang'ayo F.L.O, Hill, M.G. and Wright, D.J., (2002). Potential hosts of Prostephanus truncatus (Coleoptera: Bostrichidae) among native and agroforestry trees in Kenya. Bulletin of Entomological Research, 92(6):499-506. Nang'ayo, F.L.O, Hill, M.G, Chandi, E.A, Chiro, C.T, Nzeve, D.N and Obiero, J. (1993). The natural environment as a reservoir for the larger grain borer Prostephanus truncatus (Horn) (Coleoptera: Bostrichidae) in Kenya. African Crop Science Journal, 1(1):39-47. Nansen, C., Meikle, W.G., Tigar, B., Harding, S. and Tchabi, A. (2004). Nonagricultural hosts of Prostephanus truncatus (Horn) (Coleoptera: Bostrichidae). Annals of the Entomological Society of America, 97(3):481-491. Wright, M.A.P, Akou-Edi, D. and Stabrawa A. (1993). Larger Grain Borer Project, Togo. Infestation of dried cassava and maize by Prostephanus truncatus: entomological and socio-economic assessments for the development of loss reduction strategies. Natural Resources Institute Report R1941. Supplier of pheromone traps: Agrisense BCS Ltd. Treforest Industrial Estate, Pontypridd. Mid-Glamorgan, CF37 5SU. UK. Telephone: (0433) 841155. Fax UK (0433) 841152 (GASGA 1993). A grain injury model for LGB infesting farm stored maize in West Africa has been developed at the International Institute of Tropical Agriculture. It can be used in conjunction with predictive models of pest population dynamics to guide the development of integrated pest management strategies (Holst et al., 2000a). The models are conveniently displayed, together with information on sampling routines.